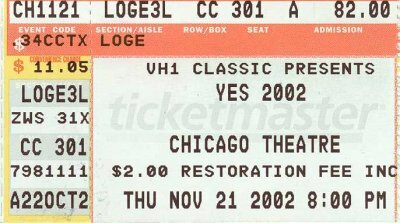 Yes Live: 11/21/02 - Chicago - Thank You! What A Special Night at The Chicago Theater!! A Wonderous Story, and Once Again I Was "In The Presence Of" ... Being My 25th Show ... 'Most Memorable'!!! The Venue Was Awesome, The Acousics Were Superb, The Setlist Was Powerful, And 'The YESMEN' WERE Harmonious AND Phenomenal!! INDEED........ 'We Have Heaven'!! What Magical Musicians 'The YESMEN' Are! I've said this before and I'll say it again, The Show At The Chicago Theater Was NOTHING LESS Than..... "A Major JAM SESSION"! Jon: The 'Maestro' Of This Great Band..... What A Voice! It Don't Get Any Better Than This! Chris: What Is There To Say... The Best Bassman EVER, Energetic, CHRIS As We All Know Him!! Steve: The BEST Guitarist Going!!! Tonight As Always........AWESOME!!! Alan: MY MAN........He IS The Bus Driver!!! The Best Of The Best!!!! 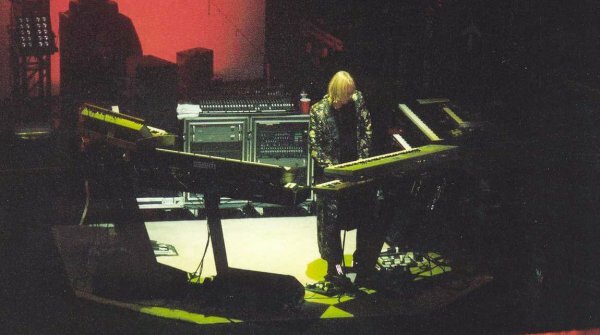 Rick: As Jon has said....He IS The Original Wizard Of Keyboards! He Was ON FIRE! 'YES' Music.... You Just Don't Hear it.....YOU FEEL IT! .... DEEP IN YOUR SOUL!! Hightlights For Me? The Whole Show!!! 'NINE VOICES' Was Truley Inspiring!! Those Kids from Lincolnwood Choral Must Have Been On Cloud 9........I WAS!!!! There is Nobody in this business that would do this, But Jon!!! Thank You!! I want to Thank 'The YESMEN'!!! Your Music has brought so much Joy Into My Life and Other's As Well.......This Has Been A Tour To Remember To Say The Least!!! ........ You Come Play........I'll Be There!!! I want to Thank My Bud Amos.... Great Seats, Excellent Show!! Captain: The next time WE Will Get Together!!! Rebecca: One Day............We Will Meet!!!! And To John from KC.......I'm Glad You Enjoyed The Show!!!! To My BEST BUD........ *BIGTIME* ............. FOREVER!!! And To Everybody That Was At The Chicago Theater Nov 21st Happy Holidays!!! God Bless 'YES' And ......... See You Next Summer?????? As The Lincolnwood Chorale Would Say.....And I Agree......."YES ROCKS"
I wish to thank all of the phenomenal YES fans for a night never to be forgotten by 50 teenagers who had the incredible privilege of performing with the group yesterday evening at the Chicago Theatre. I am the Director of the Lincolnwood Chorale, Steven Kikoen. 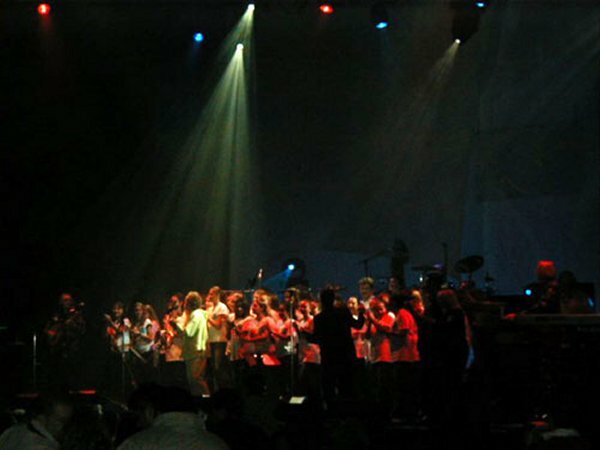 The Chorale is a group of students ages 13 to 18 who are comprised mainly of students from Niles West High School and Lincoln Hall Middle School based in Lincolnwood, Illinois. I wrote an arrangement of NINE VOICES for youth choir. When Jon became aware of it, we were originally going to have a recording session with the kids and Jon at Symbiotic Sound & Software Studios in Arlington Heights, Illinois. 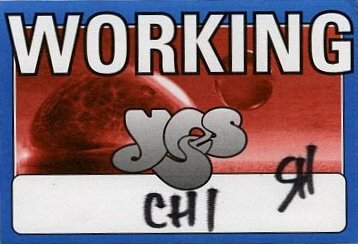 Working with YES and their management office, it was suggested that the kids sing with Jon and YES on-stage during their Chicago visit! Symbiotic Sound & Software owner Mitch Goodman believed in the project to such an extent that he donated all services in the recording of our arrangement of NINE VOICES by the students - to be sent to the band. After hearing our arrangement, Jon contacted me and we began working out the details of making NINE VOICES happen in Chicago. During the Chorale�s rehearsal with Jon, Steve, Rick, & Alan, there were so many magical, amazing moments! It was as if the students were having a "master class" with YES! Working out the arrangement (tempo, the new intro chord structure) with the kids and the band during sound check rehearsal was an outstanding educational experience for these students, many of whom were major YES fans in their own right (can you imagine a 14 year-old who knows the form and structure of "AWAKEN!"). 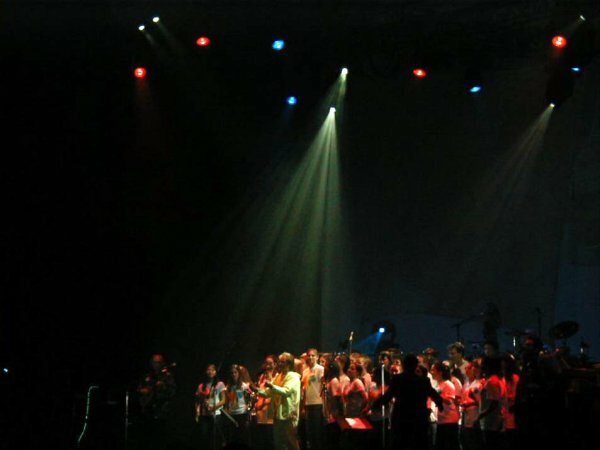 The rehearsal with YES was a huge highlight for the kids, not to mention the overwhelming gracious and warm response from the audience during the performance! This was a defining moment in the lives of these teenagers -- a moving, spiritual experience that they will treasure always. We wish to thank Jeff, Paul, and Ken from the YES entourage for all of their help -- and especially Jon, Steve, Rick, Alan, and Chris. We also wish to thank Mitch and Amy Goodman of Symbiotic Sound & Software, Debbi and Jerry Brodsky, and Bethany Thrower who assisted greatly in making the project happen! And finally . . . the teenagers of the Lincolnwood Chorale for embracing progessive rock music and everything the YES stands for. If anyone would like me to e-mail them an mp3 of the original recording that was made of the Chorale singing NINE VOICES, or would like any pictures of the Chorale in rehearsal or performance with YES, please e-mail me at studiosk@aol.com. In the words of my students: "YES ROCKS!" wow...thats all i can say. i was a part of the choir made up of high school(Niles West) and jr. high (Lincoln Hall) students. i hope the song 9 voices sounded good from the audience ( i was one of 5 basses and it seemed that the bass part was kinda weak). we only had a week and a half to prepare for the show and i think we did a good job on stage. as for the show itself i was blown away. it was a tremendous experience, all the way form the soundcheck before the show w/john and rick through the 1st half and up to the final moments of starship trooper. i was hooked. 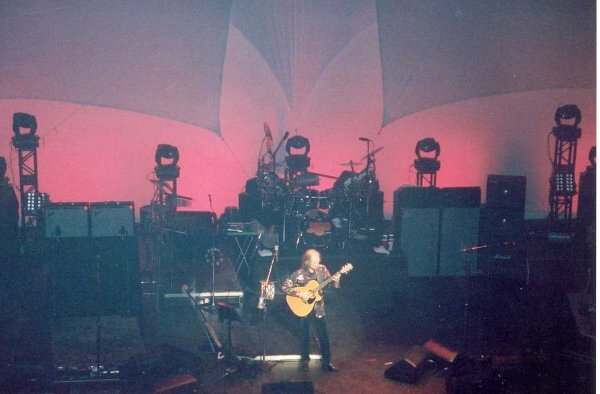 this was my first yes concert and i hope it will not be my last. Excellent show. Jon's voice, unfortunately, took a few songs to get warmed up, SK was fairly weak, Magnification was all right (probably because it's tuned to his older pipes) but he wasn't really "on" until We Have Heaven. Given that there was no Roundabout, I had hoped Wakeman would have rocked out a bit harder during the Trooper close, but one can't have everything. 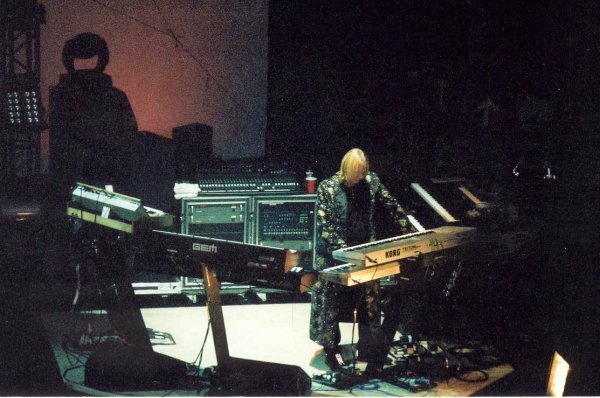 Watching him leap from keyboard to keyboard all night was quite a bit of fun, and I kept thinking about the old Hoax from the Edge where Wakeman and Deep Blue square off. I liked Magnification live just fine, although I agree that watching a bespectacled Wakeman trying to keep up with the sheet music is fairly amusing. I thought it deserved more credit than it got. In the Presence Of, however, is boring beyond belief. The choir doing Nine Voices was cute, and I think the crowd was appropriately appreciative of the effort. Not surprisingly, Jon and the choir weren't quite on the same page, but on the whole it was a cute unexpected treat. Does We Have Heaven work live? No. Is it nice that they're trying? Yeah. South Side DID work pretty well live, despite its awful reputation. HOTS was better at the '97 OYE show in Rosemont, where Squire's bass was thrumming our chest cavities all the way up in the balcony. Still pretty decent, though. What can you say about CTTE in the proper live lineup? Very nice, better than we got during the Igor/Sherwood era. Awaken was much, much improved over the Ladder tour, where Igor wasn't sticking the transitions very sharply. On the whole, I was a little confused by the crowd. We're clearly not dealing with people who are expecting to hear the 80s hits any longer, but with some notable exceptions they seemed fairly unimpressed by the classics. Admittedly, In the Presence Of took the wind out of my sails a bit too, but when people are STILL leaving their seats when CTTE starts up, I'm really not sure what to think. 1. It looked like a Winamp visualization plugin. 2. They could have picked a much better Winamp visualization plugin, and the net effect would have been superior. You can chalk it up to longevity or you can chalk it up to album sales. But no matter how you gauge success, the band Yes stands as the quintessential symbol of '70s progressive rock. Yes also merits that distinction because its music embodies what made prog-rock so exciting and so reprehensible. 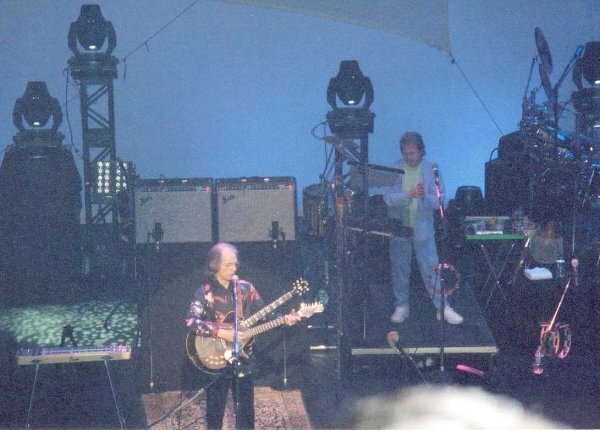 And both facets of the group's sound were displayed during Yes' well-attended set at the Chicago Theatre Thursday night. 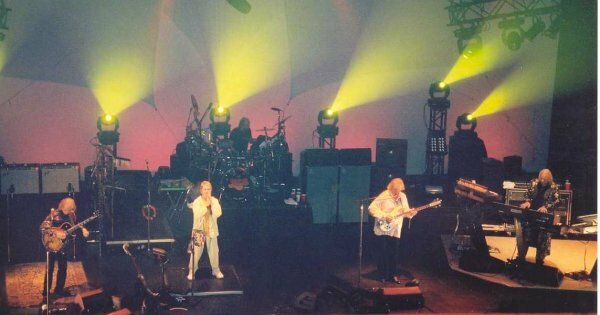 The show was particularly exciting for fans because it found Yes' classic mid-'70s lineup -- vocalist Jon Anderson, bassist Chris Squire, guitarist Steve Howe, drummer Alan White -- reunited with flamboyant keyboardist Rick Wakeman. 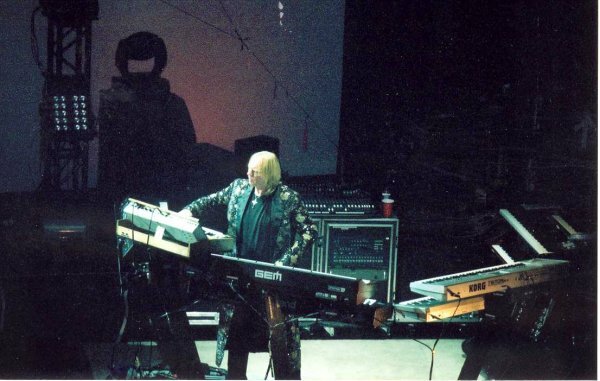 During the set opener, "Siberian Khatru," Wakeman -- in a glittering cape, of course -- had the fans on their feet by bouncing among his keyboards to contribute fast, fluid string textures, harpsichord runs, squiggly synthesizer lines and steamy organ chords. 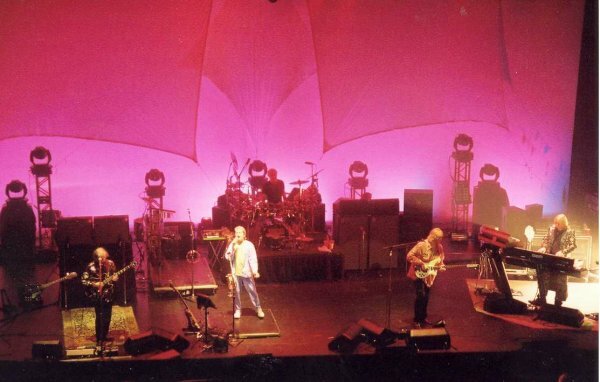 Yes filled the first half of its generous 2 1/2-hour performance with newer material, which occasionally rocked, occasionally dazzled but often simply billowed like so much artsy stage smoke. Anderson may have traded in his white robes for "earthier" lavender sweats, but his fondness for New Age Muzak often undermined the band's newer material. One longer, recent piece began with a syrupy piano ballad that could have served as the title song to a Meg Ryan movie, while "Don't Kill the Whale" came off as an earnest but melodically punchless anthem that should have been harpooned years ago. 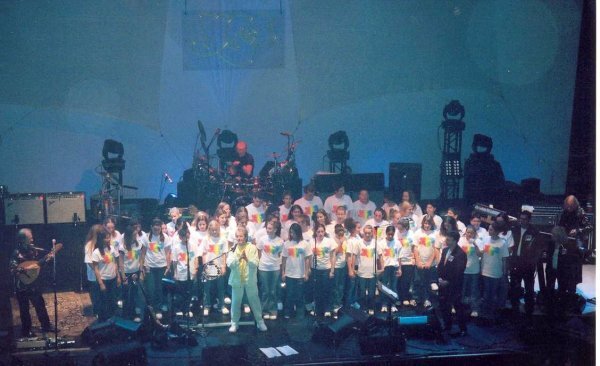 In one of the evening's genuinely charming moments, a children's choral group from Lincolnwood was asked to join Yes on stage for an acoustic rendition of "Nine Voices (Longwalker)" after members of the band overheard the choir singing one if its songs. Yes eventually tapped into what made it famous with "South Side of the Sky," a craggy, jagged rocker that the band dusted off and delivered with all the rough-edged energy that marked Yes' best early work. The song bristled with the crunchy riffing and prickly fills of reinvigorated guitarist Howe, whose specially rigged guitar stands enabled him to move from electric to acoustic to lap steel axes. 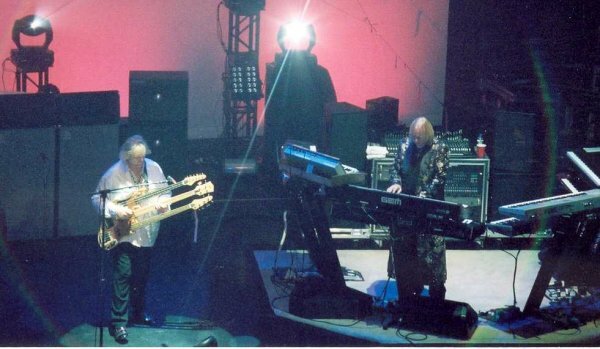 But what truly kept Yes from going over the edge into a mystic pastel mist was its rhythm section. Bassist Squire still wields his trademark Rickenbacker like a thunder stick, and drummer White looked and played like he's still got some unresolved issues of youth coursing through his veins. 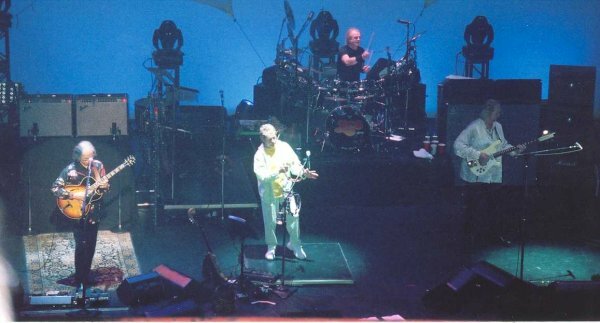 The power with which White, Howe and Squire pounded out the ascending/descending riff that opened "Heart of the Sunrise" provided a stunning contrast to Anderson's angelic, clarion singing during the song's wistfully beautiful verses and choruses. Yes' set also mingled riveting renditions of long-form epics "Close to the Edge" and "Awaken" among sometimes self-indulgent individual soloing. In so doing, it captured both the band's and the prog-rock movement's yin and yang of innovative fusion and fatuous virtuosity. 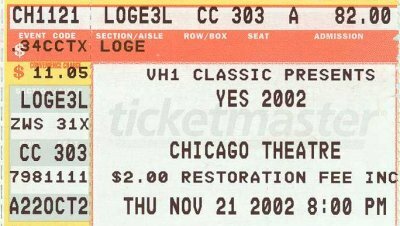 Yes came into the windy city with fire, magic & drama!!!! The first set was mind blowing with the pretty lights & awsome sound system. The second set they came out with a bunch of kids from Homewood,IL. They all sang Nine Voices. The kids were wearing their white YES t- shirts. How cool!!! Chris played that bass like anger & fury. Alan played as if he was back in the 70's. Jon sang like beautiful bird on a tree on a summmer day. Their are two performers, who sings like a bird: Jon Anderson & Oliva Newton John. Maybe they do something in the future, with YES!!!! Everytime I see Steve & Rick play on stage, they seem to have this friendly battle with their solos in each songs. It's like two Warriors at battle. It's breath taken!!!!! Jon, Chris, & Alan are in the middle with full support. They end the show with Starship Trooper in a Thunder & Lighting style!!!! Oh, by the way I no longer live in Vegas. I've been living in Chicago, the last two months. Back in sweet home Chicago. Yes is finally Back with Vengence!!!!! so, Watch out world YES IS BACK!!! I could not believe they were doing NINE VOICES Full Voice mini choir it was unbelievable . This is what the band should be doing in every city pick a different song each show and freak out the fans. This show was just to much for words . I heard the best versions of CTTE Awaken HOTS and Starship Trooper. Don't miss this show the band is out of control.